Make public: Enable the Make public checkbox when you want everyone who has access to this page to see your comment. If you do not make your feedback public, only you and the page / artefact author can see your comment. This checkbox is ticked by default. 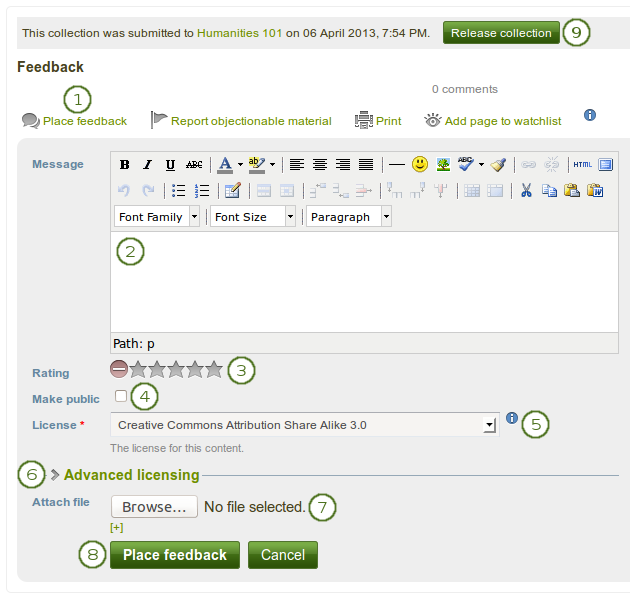 Attach file: Click the Browse button to attach a feedback file from your computer. This file is placed into the Files area of the author of the page. Click the [+] link to add another file. Click the Place feedback button to save your feedback or click the Cancel button to abort your changes. Alternatively, you can also display the page or collection that you wish to submit and click the Submit button right above the feedback and the select the group to which you want to submit your work. 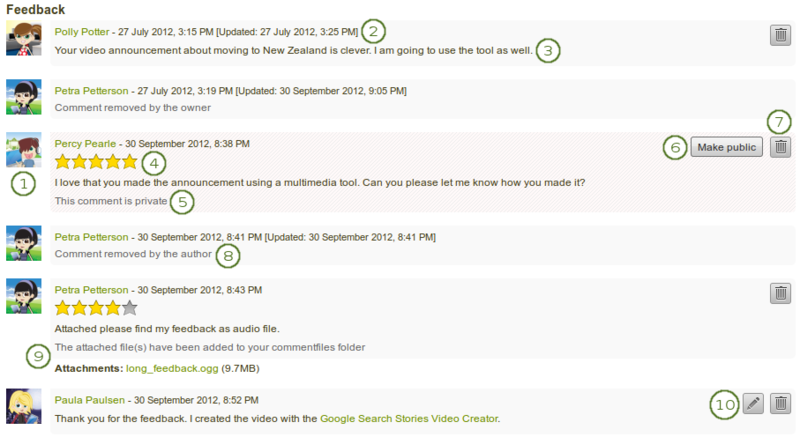 Make public: Enable the Make public checkbox when you want everyone who has access to this page to see your comment. If you do not make your feedback public, only you and the page / artefact author can see your comment. This checkbox is not ticked when you give feedback on submitted pages or collections. Advanced licensing: You see this option if the site administrator turned on license metadata. If you click it, you see two additional license fields, “Licensor” and “Original URL”, that you can fill in if this in not your own feedback.